First look photos from The Flash’s season 5 premiere suggest the action will pick up right where we left off … and in case you can’t remember where exactly that was (we don’t judge; It was a long hiatus) it involved the ‘unmasking’ of season 4’s mystery girl as none other than Barry and Iris’ daughter (from the future no less), Nora Allen, played by Jessica Parker Kennedy. While the gang looks suitably shocked that a future West-Allen baby would choose this moment — Joe (Jesse L. Martin) and Cecille’s (Danielle Nicolet) baby party — to reveal her identity, we are particularly interested to note that the odd coolness between Nora and Iris (Candice Patton) continues to be a thing. Hmm. However, whatever beef Nora has with future Mom Iris doesn’t stop her from suiting up with Dad (Grant Gustin) to catch some bad guys, and even take a tumble along the way. Catch the full photo gallery below to see more moments from the premiere. 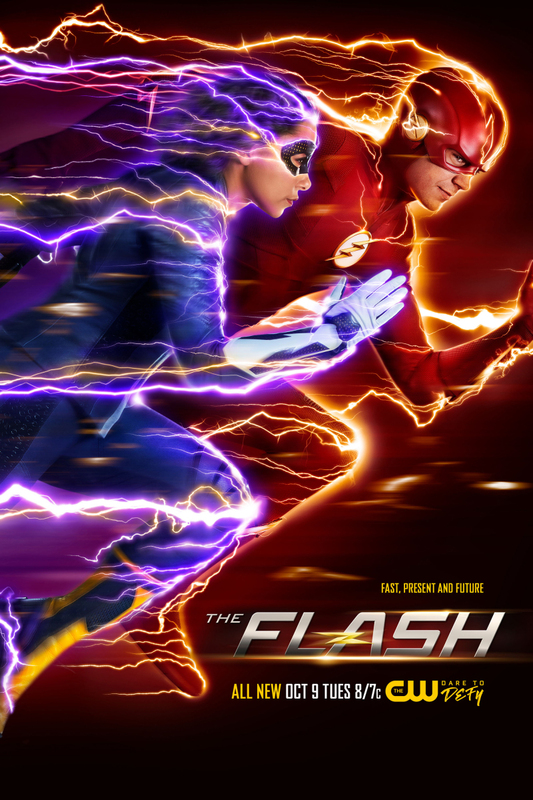 The Flash returns to our screens on Tuesday, Oct. 9 at 8/7c on The CW. Follow our official Twitter @ScreenSpy for more Flash scoop this season. The Flash -- Image: CW_FLASH_S5_8x12_300dpi.jpg -- Pictured (L-R): Jessica Parker Kennedy as XS and Grant Gustin as The Flash -- Credit: Katie Yu/The CW -- ÃÂ© 2018 The CW Network, LLC. All Rights Reserved.